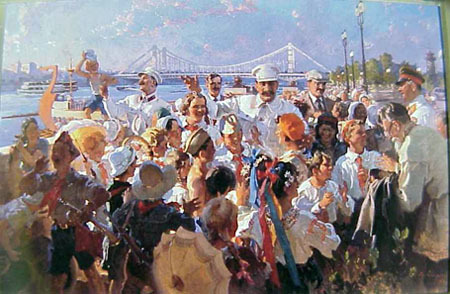 Vasilii Svarog (Vasilii Korochkin, 1883-1946), Stalin and Members of Politbureau in the midst of children in Gorky Park, 1939; what a happy scene! Doesn't this remind you of an earlier French painting? Read the textbook chapters 37 and 41 and pages 529-34 of chapter 38. Check the remarks by Professor Blois and Professor Evans on the Stalin. Listen to the series of exchanges between Christopher Hitchens and Robert Service as they discuss the legacy of Trotskii, or whether there ever really was a Trotskiite alternative to Stalinism. This was part of the Uncommon Knowledge program (You might need to check the August 2009 archives). For 50 points maximum extra credit, watch Pokayaniye (Repentance) and write a one-page paper about its portrayal of Stalinism. For 50 points maximum extra credit, watch Utomlyonnye Solntsem (Burnt by the Sun) and assess its depiction of the early Stalinist purges in a one-page paper. For 50 points maximum extra credit, read John Scott, Behind the Urals: An American Worker in Russia's City of Steel (1942) and write a one-page paper about this American's experiences in Stalinist Russia. For 50 points maximum extra credit, read Isaac Deutscher, Stalin, a Political Biography (1967) and write a one-page paper explaining Deutscher's understanding of Stalin's political "success." For 50 points maximum extra credit, read Amy Knight, Beria: Stalin's First Lieutenant (1993) and write a one-page paper explaining the basic processes of the Great Terror. For 25 points maximum extra credit, read Stalin's "On the Industrialization of Russia" (*.pdf) and explain the main rationale for Stalin's policies in a paragraph.